NEW YORK — Garry Kasparov doesn’t like the way the relationship between President Donald Trump and Russian President Vladimir Putin is taking shape. “Oh, it’s a long list. You know? He has never criticized Vladimir Putin. He always, you know, came up with some kind of moral relativism. You know, comparing, you know, Putin’s actions with, you know, those of the United States,” Kasparov said. Kasparov is referring specifically to an exchange Mr. Trump had with Bill O’Reilly of FOX News. “There’s a lotta killers. We got a lotta killers. What do you think, our country’s so innocent?” Mr. Trump replied. “You could hardly find a person that Trump didn’t touch. But Vladimir Putin was always an exception,” Kasparov said. A former world chess champion, who became one of Putin’s most vocal critics in Russia and authored a new book on Putin’s regime, Kasparov was arrested and beaten multiple times. He finally fled the country four years ago, before fellow dissident Boris Nemstov was murdered and Vladimir Kara-Murza poisoned twice. 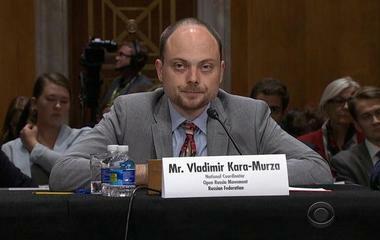 “Because the way Putin has been presenting the world to Russian people is ‘yes, we do certain things you may not like. So everybody does it. And now, see, president of the United States confirmed it.’” Kasparov said. This week, after Kasparov criticized the idea of equivalence, Iowa Congressman Steve King questioned Kasparov’s concern. “I would say Garry Kasparov, now he’s in the United States, but he lived a long time in Russia with a very loud megaphone of dissent against the regime. And he’s still alive and well,” King said in an interview with CNN. “The representative of the United States and a member of the House, I mean, basically saying that, you know, if this person is alive, you know, that’s a proof that Vladimir Putin, who killed, by the way, many other people, you know, he’s still not that bad,” Kasparov said. He says Putin’s goal is sew instability here and capitalize on the divide, which is why he finds the president’s remark so troubling.